A bit of a different approach for the Week 7 blog. Following an 0-4 week, two of the losses again coming in close games, I was tempted to re-watch every close game of this season and chart Al Jefferson’s defense in pick-n-rolls, something which I have written about plenty of times before. 25 games in we’ve been the third worst team in clutch situations in the whole league, according to NBA.com (the last 5 minutes of a game where the point difference is 5 points or less). Both our offense (85.9 points per 100 possessions) and defense (112.5) would be the equivalent to the league’s worst during the stretch of a full game. To make matters worse, we’ve played the second most “clutch” minutes having been in such situations in 16 games and for 83 minutes. You can imagine how so many bad “clutch” minutes have worked out for us. I’ve touched on our pathetic last possessions before (an update to the video that accumulates all of the Kemba screen-and-rolls has been made this week as well), yet, besides terrible play-calling down the stretch, it is quite obvious that our starting line-up will have trouble scoring against the best opponent line-ups due to spacing and lack of creativity issues talked about beforehand (so many times that I don’t even feel like adding a hyperlink). What I didn’t know and only had a hunch about was how damaging Al Jefferson could be on defense down the stretch. Charting his pick-n-rolls and coming to a conclusion is a tricky task. One could easily swing the outcome one way or the other by making some executive decisions that favor his narrative. I do, however, believe that I maintained my integrity throughout the process. Pick-n-rolls that Al Jefferson guarded in fourth quarters and that ended in a turnover, foul, assist or a field goal attempt were the ones being charted. There, of course, are plenty of variables that present themselves when counting up such plays. Jefferson might, hypothetically, give up a mid-range shot by a point guard when in fact his team-mate didn’t properly “ice” the pick-n-roll. Perhaps, a weak-side defender shouldn’t have helped out so much and thus given up a three on a drive off a pick-n-roll that Al would have otherwise contained. Throughout the process Jefferson’s allowed points-per-possession remained between 110 and 120 though. A couple of shots might have hurt him unfairly (and I will place blame on the suspects as well), but then again some turnovers would be forced by guards (or committed by the offense due to carelessness) where Al had nothing to do with it. The fact that the points given up/pick-n-rolls faced ratio didn’t wildly fluctuate on a game-to-game basis allows me to believe that it can be trusted and by my observations and calculations it is 116.2 points given up per 100 possessions (86 points off 74 pick-n-rolls). During the slate of a full game it would mean the we trail the 30th placed Lakers (110.5) about as much as they trail the 18th best Orlando Magic (104.4). Let’s break down a game of this past week, the time we lost to the Grizzlies in double overtime as it is still somewhat topical and provides a larger amount of plays to display. In this game the 9 pick-n-rolls which Al faced produced 10 points for the Grizz what would amount to a defensive rating of 111.1. I don’t know about you but this being a regular occurrence concerns me. At the end of the day, a fully complete close-out and contest of a raised hand must help to some degree. To stress the fact that this is not a case just against Jefferson but that the whole team could improve on this, I have to remind you that our guards haven’t been perfect either. Obviously, not having any data to prove this, I can’t claim that this is true but I would say that our back-court this season has been worse at “icing” pick-n-rolls and providing the necessary first action of denying the ball-handler access to the screen. That’s Lance Stephenson, who being caught on a subtle fake by Iggy, all of the sudden is no longer in the position of denying the middle. It is way harder for the big to contain the pick-n-roll if the ball handler can use his strong hand and drive interrupted through the middle, while the screener is cutting alongside him. 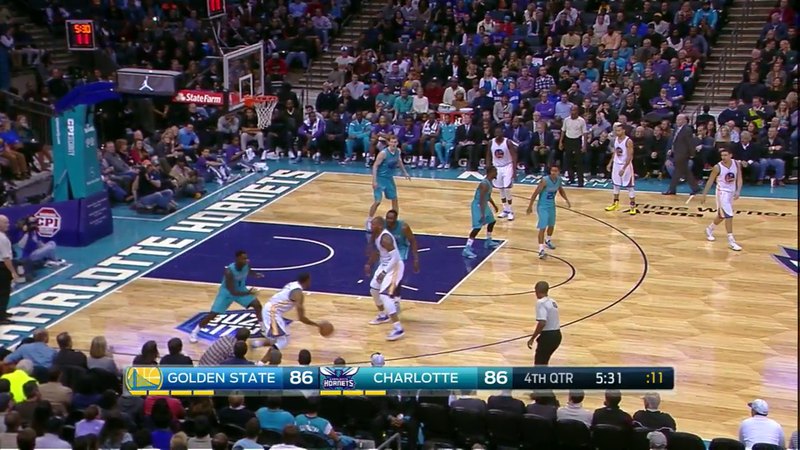 This play ended in a Speights lay-up at the rim and Golden State taking back the lead with 5 minutes left in the game. That’s 135.29 points per 100 possessions or 11 out of 17 field goals, good for 64.7% (one of them being a Pero Antic three). Sure, our defense is constructed conservatively so we wouldn’t over-help on mid-range jumpers but either way they are so open that opponents have been making them. Moreover, what’s important in these “mid-range efficiency” debates is that you can’t underrate their impact. Yes, the game nowadays is much more three-pointer reliant and mid-range looks are a thing of the past. But when they are being made, they still scare defenses into helping (as evidenced by the previously mentioned corner three looks which start with help defenders trying to help Jefferson). It’s just hard to watch our starting line-up against other team starting fives. The Cavaliers, per example, can run any sort of pick-n-roll between Irving, LeBron or Love whenever they want to. They’ll get a good shot out of it or get defenses scrambling to prevent that shot which in turn will create another good look. 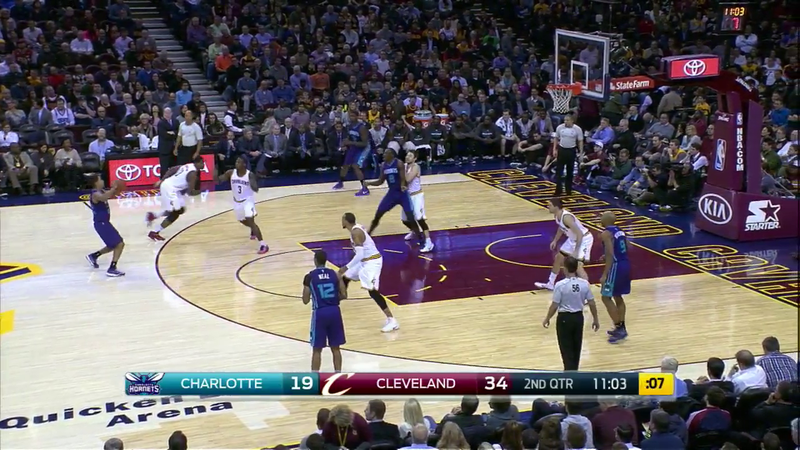 All we can basically get is an Al Jefferson post-up shot over two defenders or a Cody Zeller jumper off a pick-n-pop. That’s it. Our starters so rarely will break down defenses. It’s swinging the ball around the perimeter and finding nothing until someone has to put up a mid-range shot off the dribble or enter it into Al. Defenses flat-out don’t care about our starting guards and wings coming off screens or running a pick-n-roll. They’ll gladly go under it. That’s how you get a 0-21 start at Cleveland or be horrible at closing out games on offense. Meanwhile, our bench has been a pleasant surprise with another shooter in Marvin Williams being added to their possible line-ups. Even though not universally respected, Biz can still set a mean screen and dart to the rim the next second (he lacks the proper timing but at least Lance has rewarded Biyombo with a few lobs for alley-oops this year as opposed to previous seasons), while the other three guys are quick to pull the trigger when the chance presents itself. They’ve scored 117.0 points per 100 possessions during the last six games (in 39 minutes; a defensive rating of 101.9), while their offensive rating for the season has been 118.5 (though that adds only five more minutes of a sample size). Those numbers have been high even with Stephenson not meshing with them to such a degree, recording an offensive efficiency of 98.6 when playing with this 4-man line-up (7 games, 23 minutes) and hurting their cause. Matthew Dellavedova has to “tag” (bump the screener to stop his free movement and get back to his position) Biyombo since Cleveland tends to hedge pick-n-rolls. Only the screener in this pick-n-roll is Marvin Williams who can drift off for the open three with Delly “tagging” the cutting Biz. The majority of defenses don’t give you these opportunities, but if they do hedge, Marvin can hurt them as he did a couple of times at Cleveland. Kudos to the guys and here’s hoping they keep it up. Biz grabbed 9 offensive rebounds in the 60 minutes he played in four last week’s games, good for 2.2 per game. That actually is on par with what he has been doing all season long as you can always find his spot among the best offensive rebounders fluctuating around the top5. Him having career-highs in points, rebounds, free throw attempts and blocks per 36 minutes is indicative of his highly-efficient hustling this season. It seemingly has translated itself into much more positive plays and less blunders than the previous years. Too bad that while Zeller also blocked a potential game-winner by Marc Gasol in the first overtime, Jefferson continued to struggle as the Z-Bo match-up also presented him with plenty of troubles. No contest here. Gerald Henderson leaving Courtney Lee and switching onto (instead of “stunting”) Marc Gasol takes the cake. Updated with the last possession against Phoenix and an early-season play against Atlanta that I initially had forgot about since Lance would finish the game with his banked-in game winner. Amazingly, we managed to get another game winner this way with the miraculous Hendo tip-in at Memphis. This entry was posted on December 19, 2014 by ReinisLacis in Charlotte Hornets blog and tagged Al Jefferson, Bismack Biyombo, Cody Zeller.